Need the ultimate is style and comfort while you transport your guests to your wedding or reception? Consider our 16-18 passenger chauffeur driven Executive Limousine Coach. 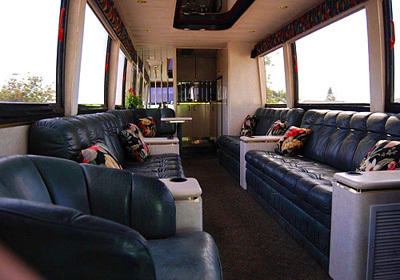 Amenities include: Fully Air Conditioning, Seating for up to 18 passengers, Big screen television, VCR and Bose Stereo System, Wet bar facilities, Bathroom, Mirrored ceiling with indirect interior lighting, Designer lounge chairs and couches, Fully carpeted and leather interior, Non-glare Venetian window shades, and Guest Host/ Hostess services included. This luxury vehicle is the one-of-a-kind in the State of Hawaii and is meant especially for those who want the very best!